INDIANAPOLIS — People around the world are already celebrating the start of the new year. Here in central Indiana, first responders want people to start the year off in a fun but safe way. Local medical practicioners and local law enforcement are urging people to celebrate responsibly. "There's going to be a lot of partying, a lot of get-togethers, there are going to be people making some bad decisions around you and so if you are the one drinking, acting in moderation is the best way to be," Dr. Steven Wipprecht, of IU Health, said. Wipprecht said people should watch out for their friends. If anyone shows signs of confusion, vomiting, slow breathing or loss of consciousness it may be a sign of alcohol poisoning. People are urged to contact 911, but there are things people can do in the meantime. "Either do maneuvers to help with their airway and their breathing and just put them on their side so if they are vomiting that those secretions don't go into the lungs," Wipprecht said. 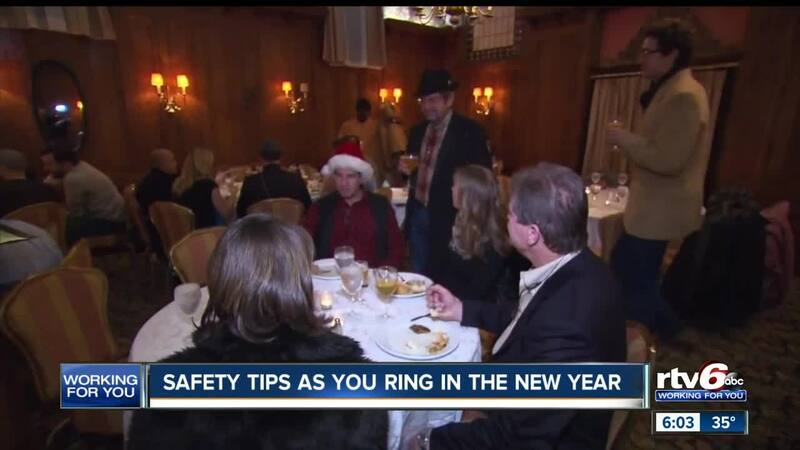 Data shows 48 percent of driving deaths on the highway on New Year's Eve are alcohol-related. With services such as Lyft, Uber, taxis and designated drivers, police said there's no excuse for impaired driving. "There is no excuse to get behind the wheel when you have consumed too many alcoholic beverages and have no business or reason to get behind the wheel of a motor vehicle," Deputy Chief Gary Woodruff, of the Lawrence Police Department, said. Along with drinking, officials said there is also another issue on New Year's Eve — celebratory gun fire. The Centers for Disease Control and Prevention report when a bullet is fired in the air, it returns to the ground at a velocity greater than 200 feet per second. It's a force strong enough to break through a skull and cause serious injury or death. "Those bullets don't have eyes and I think anybody would be sick if they found out that their New Year's Eve celebration resulted in somebody being injured or worse," Woodruff said.